UPDATE: Knife Rights’ Texas Knife Law Reform Bill Signed! Bowie Knives to be Legal to Carry! As we were in Washington, D.C. yesterday lobbying on our Knife Owners’ Protection Act including repeal of the Federal Switchblade Act we received the welcome news that Texas Governor Greg Abbott signed into law Knife Rights’ bipartisan Texas Knife Law Reform Bill, HB 1935, that repeals all “illegal knives” in Texas statute. We must once again express our gratitude to our House sponsors, Primary Author, Rep. Frullo, Joint Authors, Reps. Dutton, Kuempel, Moody and Springer and Coauthors, Reps. Canales and Lambert as well as our Senate sponsor, Sen. John Whitmire. Under the most difficult circumstances they stood tall for Texas and freedom and got this bill done. Thanks also to all of you who called and emailed in support. HB 1935 eliminates daggers, dirks, stilettos, poniards, swords, spears and most notably, Bowie knives, completely from Texas statute, effectively allowing them to be carried anywhere in the state. WARNING: the new law does not go into effect until September 1, 2017. Until then, existing restrictions on “illegal knives” remain in pace. In 2013 Knife Rights’ repeal of Texas’ switchblade ban was enacted. In 2015 we got Knife Law Preemption enacted, removing all local knife ordinances more restrictive than Texas state law. Now in 2017 we have removed all of the “illegal knives” in Texas law, finally allowing Texans the right to carry a Bowie knife. But, we are not yet finished. We will be back in two years to see about striking those last remaining minor knife restrictions in Texas. We won’t stop until Texas is a free as everyone thinks Texas is. This is a perfect example of why your support is so important. Otherwise, there’s no way we could have afforded for Todd to spend nearly a month in total in Austin shepherding this bill through the legislature under the most trying of circumstances. Your support is critical! and you could WIN YOUR CHOICE from OVER $190,000 in Knives, Guns and More! 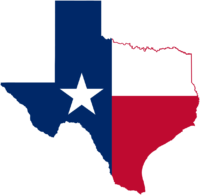 UPDATE: Knife Rights’ Texas Knife Law Reform Bill Passed! Call Governor Today! Knife Rights’ bipartisan Texas Knife Law Reform Bill, HB 1935, to repeal “illegal knives” in Texas statute, was passed yesterday evening as the deadline approached on the Senate Local and Uncontested Calendar. Thanks to everyone who responded to our Alert and called the Lt. Governor yesterday evening. It is now off to Governor Greg Abbott for his action. Our thanks to our Senate sponsor Sen. John Whitmire for his efforts on our behalf. And, once again, we must express our thanks to our House sponsors, Primary Author, Rep. Frullo, Joint Authors, Reps. Dutton, Kuempel, Moody and Springer and Coauthors, Reps. Canales and Lambert for standing firm in challenging circumstances. After the tragic University of Texas stabbing, this bill was most certainly dead without the kind of effective advocacy and lobbying skills that comes from Knife Rights’ Director of Legislative Affairs Todd Rathner’s years of experience. Negotiating a bipartisan compromise that kept 95% of the bill intact, Todd spent nearly three weeks in Austin shepherding this bill through to passage. This is a perfect example of why your support is so important. Otherwise, Todd could not have spent nearly three weeks in Austin and this bill would have died. It’s that simple. Your support is critical! Help Knife Rights continue to forge A Sharper Future™ by making a donation in the Ultimate Steel™ and you could WIN YOUR CHOICE from OVER $170,000 in Knives, Guns and More! Knife Rights’ bipartisan Texas Knife Law Reform Bill, HB 1935, to repeal “illegal knives” in Texas statute, was passed out of the Senate Criminal Justice Committee by a unanimous vote. It now goes to the floor on the Local and Uncontested Calendar. Keep your fingers crossed. Knife Rights Director of Legislative Affairs, Todd Rathner, has been in Austin again for another full week working to get this bill passed. HB 1935, as amended, eliminates daggers, dirks, stilettos, poniards, swords, spears and most notably, Bowie knives, completely from Texas statute, effectively allowing them to be carried anywhere in the state. However, in order to get the bill moved after the tragic University of Texas stabbing, the amendment stipulated that knives with blades over 5 1/2 inches are now defined as “location restricted” knives. These knives may be carried all over the state except in a narrow list of places such as schools, colleges, correctional facilities, houses of worship, and bars that derive more than 51% of their income from alcohol sales. This is an unfortunate amendment, but the alternative would have been to watch the bill die and throw years of work in Texas down the drain. This bill’s passage would still be a huge win for knife owners in Texas and given the tragic circumstances, Todd’s done an incredible job not just saving the legislation, but ending up with 95% of what we wanted. If we get this bill passed, we will be back in two years and again try to finish the job in Texas. This is a perfect example of why your support is so important. Otherwise, Todd could not have spent two weeks in Austin and this bill would have died. It’s that simple. Your support is critical! Knife Rights’ bipartisan Texas Knife Law Reform Bill, HB 1935, that would repeal the ban on ALL “illegal knives” in Texas statutes, has passed out of the House Criminal Jurisprudence Committee by a unanimous vote and is now headed to the Calendars Committee. HB 790, the other knife law reform bill that only repeals the ban on daggers, also passed out of the Committee. Thanks to everyone who called or emailed the Committee Members. Your calls and emails make a difference. As soon as HB 1935 is scheduled for a floor vote, we’ll let you know to call or email your Representative. Sponsored by Rep. John Frullo with co-sponsor Rep. Harold Dutton, HB 1935 would complete Knife Rights’ efforts to bring knife freedom to Texas by removing entirely the definition of “illegal knife” in Section 46.01(6) of the Penal Code. This includes the prohibition on double edge blades, Bowie knives and the 5.5-inch carry limit. 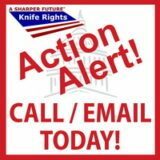 Knife Rights’ bipartisan Texas Knife Law Reform Bill, HB 1935, that would repeal the ban on all “illegal knives” in Texas statutes could be voted on by the House Criminal Jurisprudence Committee as early as Monday April 17th. It is important to call and email the members of the committee so that they are aware of the importance of this bill to the public. If you live, work or travel in Texas, please contact the committee members TODAY and politely ask them to “please vote “YES” on HB 1935.” That’s all you need to do, short and simple. Sponsored by Representative John Frullo with co-sponsor Rep. Harold Dutton, HB 1935 would complete Knife Rights’ efforts to bring knife freedom to Texas by removing entirely the definition of “illegal knife” in Section 46.01(6) of the Penal Code. This includes the prohibition on double edge blades, Bowie knives and the 5.5-inch carry limit. Rep. Dutton was honored with Knife Rights’ Freedom’s Edge Award for his role as sponsor of Knife Rights’ Texas Switchblade Ban Repeal Bill that was enacted into law in 2013. Knife Rights is rewriting knife law in America™. Knife Rights passed the nation’s first Knife Law Preemption bill removing patchworks of local knife laws that trap unwary citizens in Arizona in 2010 and has since passed preemption bills in Alaska, Georgia, Kansas, New Hampshire, Oklahoma, Tennessee, Texas, Utah and Wisconsin. Knife Rights’ bipartisan Texas Knife Law Reform Bill, HB 1935, that would repeal the ban on all “illegal knives” in Texas statutes, has been scheduled for a hearing on Monday in the House Committee on Criminal Jurisprudence.